New Zealand is home to numerous introduced species that do so well in the wild that they have become pest species. 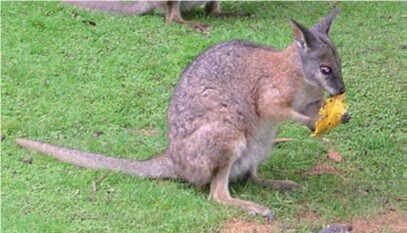 Probably the largest and least known (outside of South Canterbury and Rotorua) are Australian wallabies. Dama wallabies (Macropus eugenii) were released around Rotorua in 1912. I'm sure it seemed like a good idea at the time. Since then the population has increased and spread and is now a pest species that damages native plants, reduces plant diversity and alters local ecosystems. As such, Dama wallabies have been controlled using poison baits and hunting for several decades. 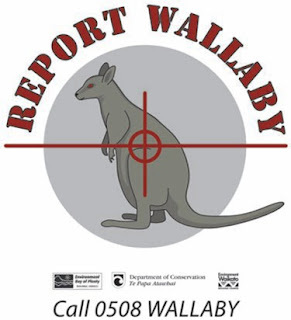 As with any situation where you have long-term control, the wallaby population has built up a resistance to the main toxin, 1080. There is also a growing concern from the public about the use of this compound and so alternative toxins are being investigated. A recent study by James Ross and Charlie Eason (Lincoln University) as well as several colleagues from Connovation Ltd, Department of Conservation, and University of Auckland was published in New Zealand Journal of Ecology. In this study the team looked at the effect of the toxin Ferratox (a cyanide based compound with low secondary poisoning risks an high humaneness). Their study site was a 32 ha block of degraded forest south-east of Rotorua. Surveys were done to estimate the local wallaby population and 24 wallabies were captured and fitted with radio collars so that they could be followed. The toxin was loaded into a baits and laid out throughout the study area. Half of the collared wallabies were found 3-8 km from the study site a week later showing how much the population moves around. 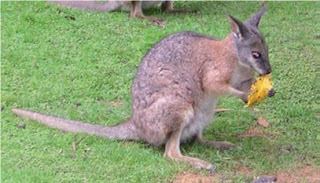 Eleven of the twelve that remained in the area were killed by the ferratox baits as well as at least 20 other uncollared wallabies. These results are extremely promising and a viable alternative to 1080 seems to have been found. I've written to suggest they replace the photo with one of an actual rat, or, at the very least, an actual rodent.